What vocation, other than that of a professional artist, is held up daily for criticism and review? Whether you are a performer, a writer or a visual artist, everyday your work is out there for evaluation. What motivates someone to endure this scrutiny? This question will most likely be answered differently by each person it is posed to. I had a conversation recently with a couple of artists who happen to be married to each other and who chose to move cross-country from Oregon to Kentucky to pursue a creative lifestyle. I was struck by their motivation and interest in making their living as artists. It’s an interesting story. Bruce and Kelley Hoefer first crossed paths in 1993 while studying agriculture at Berea College. After graduation, the couple moved to Corvallis, Ore., to work in their respective fields, Bruce in horticulture and Kelley in massage therapy. 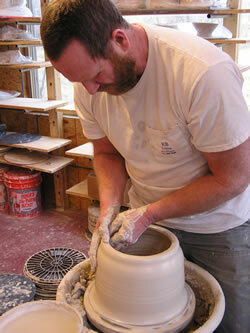 In 2000, the couple signed up for a beginner’s pottery class to have something fun to do together. Little did they know what an impact this simple decision would have on their lives. It was not long before the couple bought a potter’s wheel and an electric kiln. The journey had begun. For the next ten years in Oregon, Kelley continued working as a massage therapist, gradually transitioning to throwing pots full-time while Bruce ran a home remodeling business. All was moving well with Kelley setting up at art fairs and Bruce spending more and more time in the studio as well. Then came the recession! Central Oregon was severely impacted and the Hoefers were one of many families who lost their jobs and homes. It was time to make some hard decisions. Moving back to Berea was an idea that kept coming up. Having family and friends in the area, along with Berea’s storied history as the craft capital of Kentucky, made moving back a logical next step. With the help of family and friends, the cross-country move began, and in April 2009, Turning Wheel Pottery was established. The studio was created in a converted pole building where the couple built a 50-cubic-foot down draft kiln. The first thing Kelley and Bruce say about living in an area like Berea with so many talented artists is that they find it very inspirational. They feel working together as a team suits them well and that they have found a home as potters in Berea. These comments lead me to believe that one answer to the question asked at the beginning of this blog would be “inspiration.” Certainly creative people are drawn to each other, and we all know that there is strength in numbers, but to be inspired rather than intimidated by living in a community of other artists indicates confidence in one’s skills and vocation. The Hoefers were inspired to move to Berea to live among other like-minded people and to be part of a creative community. I’m inspired by their story. 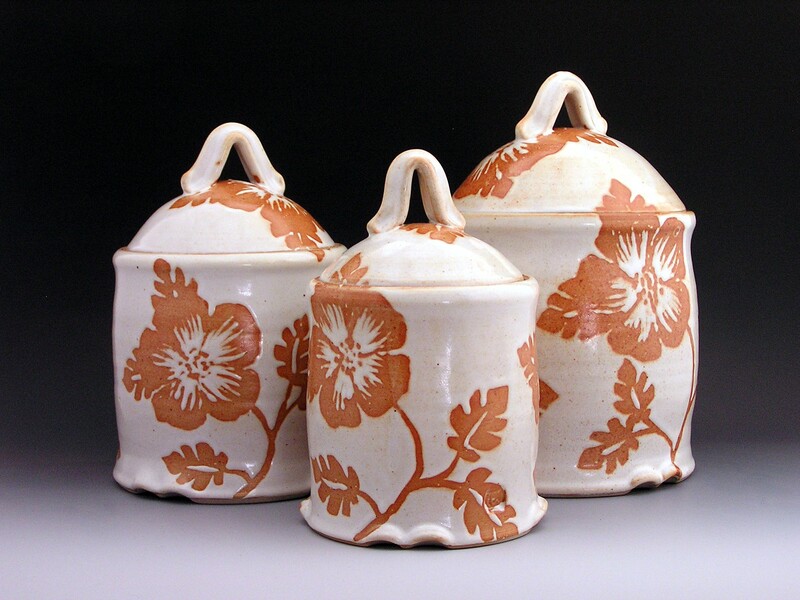 Look for Turning Wheel Pottery at the 2011 Kentucky Crafted: The Market. Kelley and Bruce will be first-time exhibitors.